You get the feeling watching Seabiscuit, that the director, like the horse he's telling you about, has got blinkers on. Throughout the movie, his eyes do not swerve from the finishing line. Then at the end of it all you realize you'd been tricked - the finishing line was just a formality, something to stay focused on while the odds were being stacked up against you. The real story is about the odds. Much like horse-racing. The movie is based on a true story and narrated by David McCullough. Like most of the United States at the head of the 1900s, Charles Howard (Jeff Bridges) is doing good. He works his way from scratch, and free enterprise doesn't let him down. Howard's hitched his wagon to the booming automobile industry, and so he goes from having 20 cents in his pocket to being a millionaire. Your typical great American dream. One of the very few that 1929 left unscathed. The Pollard family, however, wasn't that lucky. The Great Depression brings them to the streets, and when push comes to shove, they have to give up their oldest son, Red (Tobey 'Spiderman' Maguire), to the owner of a stable, who will let Red earn his keep by grooming the horses. Red grows up to be a jockey who loses consistently both on the course and off it, in the boxing ring. 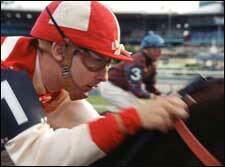 Tom Smith (Chris Cooper), a horse-handler, is another misfit, thanks to his compassion for beasts that can race no more. He takes under his wing a lame horse that is going to be put to death, and tends to it like a father. And this is how he catches the attention of Charles Howard, who comes to sunny Mexico to escape the Prohibition and the haunting memory of his dead son. It's in Mexico that Howard finds Smith, Smith finds Red, and Seabiscuit finds them all. Seabiscuit, an ungainly colt that grows into an unmanageable horse, is too small and too much of a bother to his owners. But Smith sees in him a winner, and he is taken back to train at Howard's farm. And this is where it all begins. Suddenly, a father with a broken heart, an out-of-luck jockey and an out-of-work trainer have something to believe in again - a horse that hasn't the faintest chance of winning. But he does, though. Out of the sheer perversity of fate, Seabiscuit wins every race he enters. And the odds? He's small, been ill-treated as a baby, and is deeply mistrustful of people in general. He also takes on the fastest horse in the country, is declared lame for life, and is ridden by a crippled jockey. True, there are no surprises here. You know the horse is a winner even before he starts racing. The film really is about heroes. And it's not often a story of heroes is told with such complete lack of artifice. And with such refreshing lack of greasepaint. After all, the easiest thing in the world is to put all great deeds and their doers on a pedestal, unrecognizable and way up high, so you and I can be comforted by the distance. But Gary Ross won't let you do that, and neither will Seabiscuit. Tobey Maguire, Jeff Bridges, Chris Cooper, Elizabeth Banks, Gary Stevens And William H. Macy. Be the first to comment on Seabiscuit! Just use the simple form below. fullhyd.com has 700,000+ monthly visits. Tell Hyderabad what you feel about Seabiscuit!